For digital media producers working in the museum field, the AAM MUSE award represents the peak of professional acknowledgement. AAM MUSE awards are presented to institutions or independent producers who use digital media to enhance the [museum] experience and engage audiences. The MUSE awards celebrate scholarship, community, innovation, creativity, education and inclusiveness. We are proud to announce that EDM and the Museum of Australian Democracy (MoAD) have been awarded a 2015 Silver MUSE in the category of Education and Outreach for our RFID-based interactive learning system. The award was presented to EDM Director Darran Edmundson at this year’s AAM meeting in Atlanta. 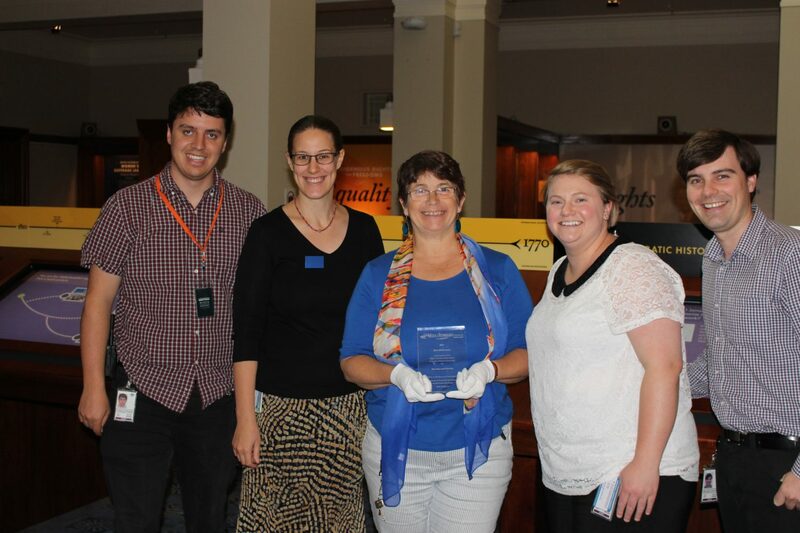 MoAD “Learning” Team with our jointly-awarded Silver MUSE Award. We cannot overstate the importance of “authentic content connections”. Too often digital museum experiences are disconnected from the surrounding material culture. TRAIL was designed from the ground-up to engage students with the building, the stories, the education staff and each other. Museums, after all, are social spaces.